Know nothing newby on the loose! As you may have guessed from the title, I'm a first time CT owner and a very short time lurker. My family and I live on a small farm about 45 mins out of Canberra at Yass River. We moved down here from Sydney in March 2017, to grab our own slice of the Aussie dream with a few extras. While we are building up the farm, and learning shed loads along the way, I still have to work full time so time starts to get a bit scarce. My family all come from WA and the last time we had a proper visit over there, my oldest was about 18 months old (she's 9 now) and a cinch to travel with. We now have 3 other children between our oldest and the youngest just turned 3. My wife and I decided it was time to go back west and see everyone, before it's too late, but we wanted to take the kids with us. After talking up airfares, car hire, accomodation etc, we decided that maybe we should wing it and make a full family holiday of it. So begins our CT adventures. After a short time looking (time will tell if it was too short), we decided that we wanted a hard floor camper that would be able to fit all 6 of us in to sleep. I'm not quite sure, how we came to that exact conclusion, but it kind of narrowed our market considerably, and when we threw our budget (including to set up our car), as well as local to the Canberra, Yass, Goulburn area, it really narrowed the field again. We ended up trumping up for a new white Ezytrail Lincoln LX Mk2. It's a thumping great thing, but it has good storage, plenty of room, and seems to be quite well made for its price point. 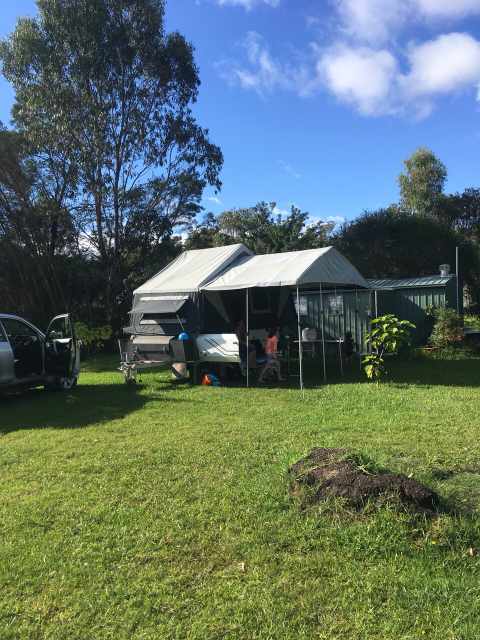 After picking it up 2 weeks ago, we "camped out" out the back of our house last weekend, just to set it up, make sure it all worked and see what we had got ourselves into. The kids loved it!, it's got plenty of room, was cozy and was an enjoyable first night stay. This weekend, we are taking it to Sydney to stay at a friends place, and at the end of the month we will be off to Jindabyne for the weekend with my brother and his family. Somewhere in there, I need to fit in getting our Prado wired up to power the CT and charge the batteries while we drive. Anyway, that's my story for the start of our CT adventures. I hope you guys can bare with me as I ask dumb questions and try to garner as much good guff that I can from you, before we head to WA next year. See you round the traps. Re: Know nothing newby on the loose! Hi Cristian and welcome to myswag. Congrats on the new CT.
Wow, I hadn’t realised it was this long since we started this adventure and no updates. We threw everything in we thought we needed for our Sydney trip. I charged the batteries and off we went. I was surprised at how well the Prado towed it with absolutely no prep. 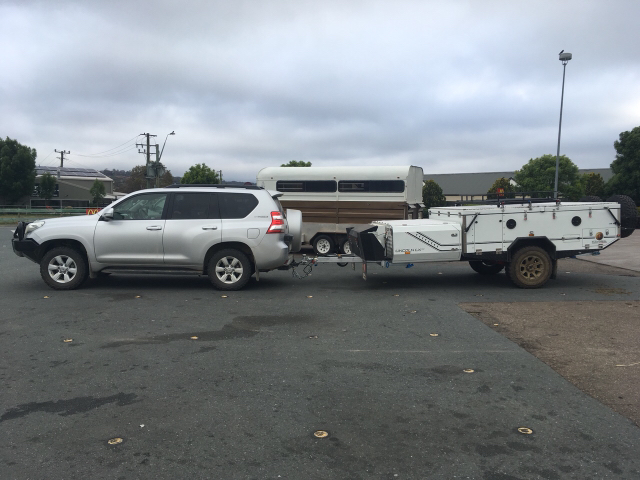 A stop at South Goulburn Maccas for breaky and s confidence check if the camper was all good (apart from the typically cold wind). Biggest thing to get my head around was how long I now am and that the camper blocks slot of the side view. Anyway, it rained all weekend. Not belting down, but a good constant soaking drizzle. Great for seasoning canvas not so for completely unseasoned campers. We survived and with some minor seeping through some of the seams, I pack up up in the rain on Sunday arvo and we headed home. I set the camper up in our tractor shed to dry and air for a couple days. We ended up cancelling that because of the pouring rain and storms forecast for the mountains. We camped out at home with the kids in the tractor shed, and the camper went out in the rain during the day. Fast fwd to the week before Chrissy and we took it to my brother in laws farm for the weekend. We decided to head through Crookwell, Tuena, Trunkey creek then onto Bathurst and Dark Corner. The Prado handled the drive well, the kids not so well, and we got our first camper fail. The weird whirring noise manifested itself on the tighter, and faster corners. I thought the Prado was loosing its fight on body roll, but it wasn’t the problem. The weekend went well, and we drive home the long way through Cowra and Boorowa. Another successful weekend done. Next trip was after Chrissy to mum and dads on the south coast. We decided to take the camper, as it gave us our own space and kept our early rising kids out of the house. The trip down was uneventful until the Brown mountain decent. Nearly every corner the whirring noise was back. At the unhitching bay at the bottom of the hill, I pulled in for a serious check over. Turns out the camper wheels were rubbing on the rear corners of the wheel arches. Nothing I could do but live with it for the Chrissy period. The set up at mum and dads went well, within the first time I put up the Annex roof as an awning. All worked out well, and the overnight rain didn’t bother us this time. My wife and I realised on this trip, that for some reason our kids sleep pretty well in the camper, sleeping a lot later than normal, as a bonus. Last trip was from New Years to the second weekend of January down at Kioloa Beach, with some friends. Everything went smoothly and again the camper survived the heavy rain, with just minor seeping on the corners next to the mattresses. Scrolled up town took care of both ends. This was our biggest trip yet, based for 8 days inn the camper, and proved a few things. I need to get a proper power supply sorted. I need to get solar sorted. The wheel arch rubbing is getting worse. We could go a week with a properly cooked and packed esky, instead of a fridge. After getting home and unpacking on Sunday arvo, I’ve dropped the camper off to get the wheel alignment and suspension height checked by the dealers this week. A couple of other very minor niggles will be addressed at the same time. Next stop....power for the camper from the car! Great little write ups for your intro Christian... Looks like you have the wet weather camping nights debit accounted for. Now for the rest of your camps to be dry hey! Vacation Camper & McTavish surfboard - what more does a guy need? ?